Heavy-Duty Cap Nut Wrench Metric 41mm Ken Tool TX241 / BOWES KT TX241. Heavy-duty design will not slip out of position. 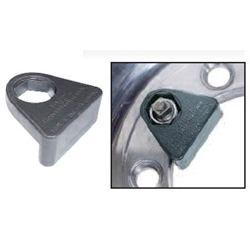 Wrench rests snugly against the center hole, reducing the possibility of rim damage. Ideal for aluminum wheels.